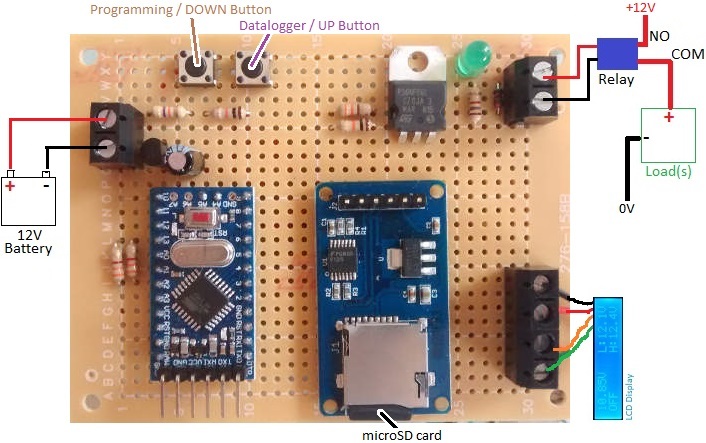 Here is our detailed review of the low-cost RC-51T USB temperature data logger. 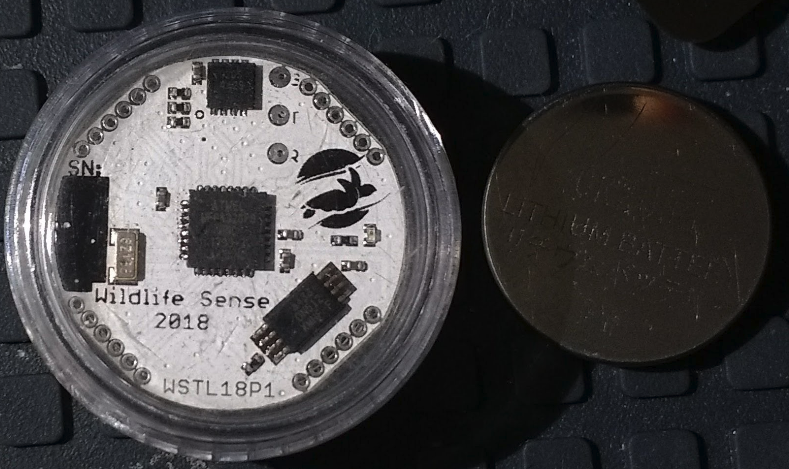 Pictured above is a high accuracy (within 0.1°C) low power temperature data logger designed originally for scientific research in sea turtle egg incubation, but which could be put to use in a great many other applications. 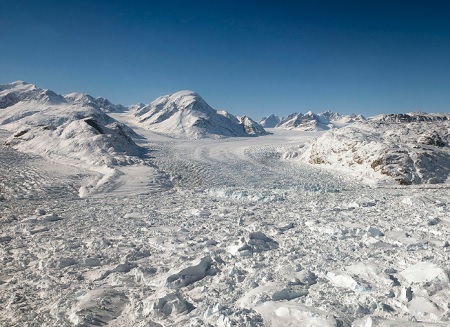 This logger measures and logs the temperature once every 10 minutes exactly with sufficient memory space to hold 180 days of data (26,000 records). The logger is powered by a CR2032 coin cell battery which can keep it running unattended for the full 180 days. 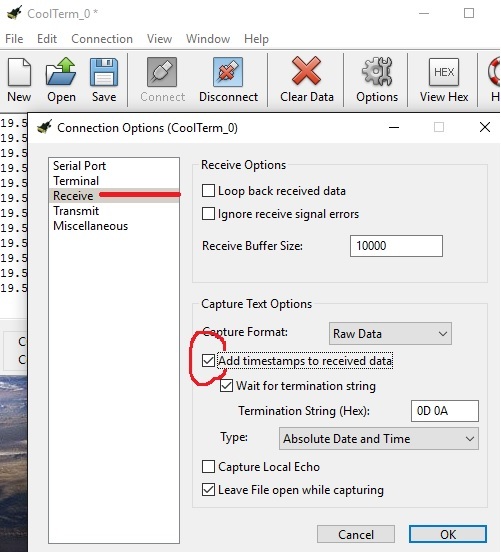 When the measurement period is over, the logger can be extracted from its waterproof case and the logged data transmitted over a UART connection via a cable to a PC for subsequent analysis. The goal of this project was to achieve all of the above at a cost per unit (of a batch of 50 units) of under €5, including the case. 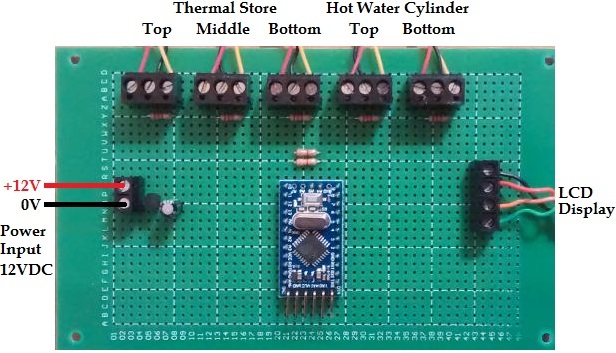 The temperature sensor used is a 16-bit resolution digital MAX30205MTA+. This gives a temperature resolution of 0.00390625°C and 0.1°C accuracy in the range 0-50°C. 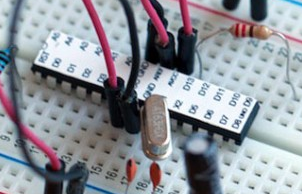 The microcontroller chosen is the ATMEGA328PB – a slightly more feature rich version of the MCU found on many Arduino boards. 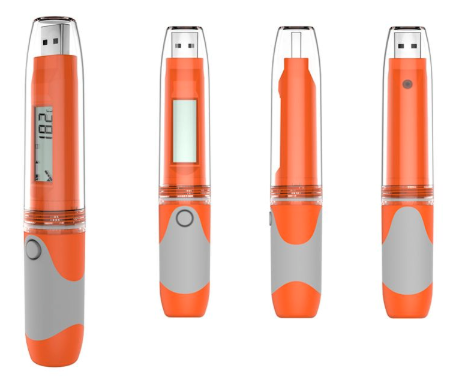 The serial flash memory chip used is a 512kbit AT25DN512C from Adesto which has sufficient space to hold the 410-420kbit of data to be logged in six months. 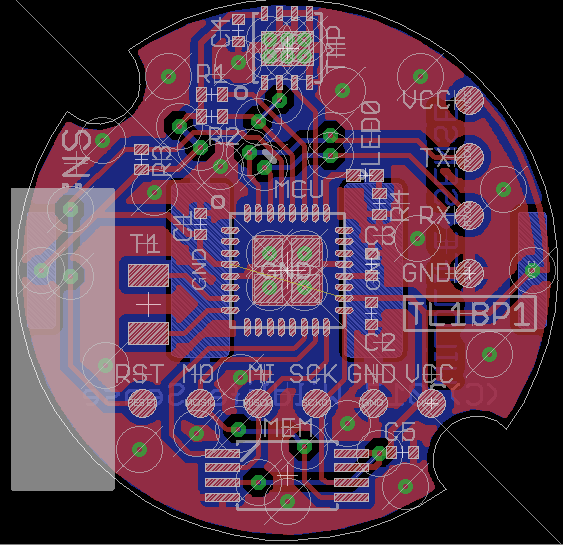 For full details, plans, and discussion of this project, click here: Low Power Cost and Size Temperature Data Logger. Pictured below is a device we were recently commissioned to design and build. This device, built around an Arduino Pro Mini, is one of the most complex projects we have completed recently. It is primarily a timer (utilising a ds3231 real time clock (RTC)) to energise a relay for a user programmed number of minutes once every day, week, fortnight, or month. 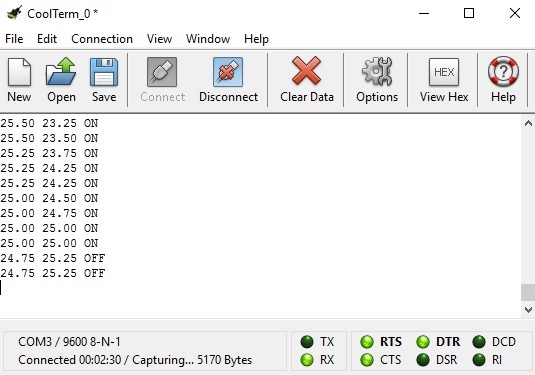 However it must also monitor and process data from three sensors and log these readings to a micro SD card for later analysis at intervals which depend on the status of the system at any one time. 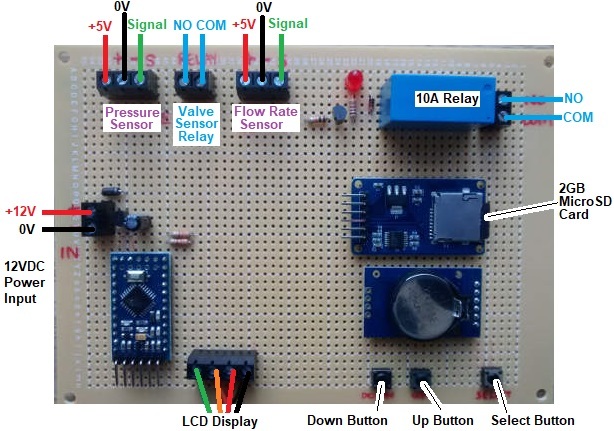 This device has a display to show the user the status of the system with readings from a pressure and a flow rate sensor as well as a valve and a relay which the device controls. 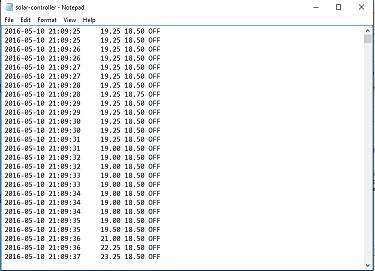 Detailed datalogging is only required when the valve is open (with logs appended at a rate of once per second), but the pressure sensor status must be logged every hour and changes to the status of the valve and other significant system changes must also be logged as and when they occur. 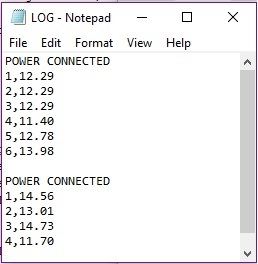 When logging data every second, it does not take long to generate a file which is unwieldy to process in Excel or other programmes. Therefore, our device creates a new file each time the valve opens, and logs to it until the valve closes again. 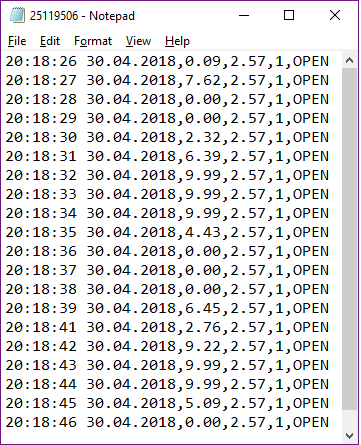 In this way, there is one reasonably sized datalog file for each valve opening event together with one master log file which is appended hourly and also when there is a significant change detected in the system. 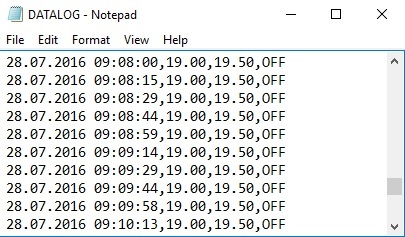 Having mulitple datalog files not always recording data at regular intervals, it was essential that the timestamp for each line record in the logs showed the actual time and date rather than just an index value. This will make future analysis of the collected data much easier. 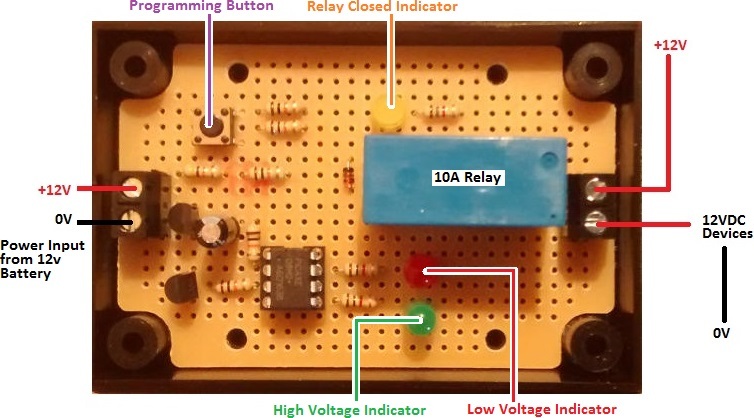 The user is able to set the number of minutes that the relay is ‘on’ and also the precise time of day at which they would like the relay to turn ‘on’. The interval between relay ‘on’ events for this particular device was set to daily, weekly (7 days), fortnightly (14 days), or monthly (28 days). An added feature is that the user can manually change the number of days until the relay will next turn ‘on’ which is particularly useful for testing the system or forcing the relay to turn ‘on’ at a previously unscheduled time and date if required. The last piece of complexity was the flow rate sensor. This sensor outputs high pulses at a per second rate which when multiplied by 0.2 gives the litres per minute rate of flow through the sensor. The results generated then had to be converted into the desired cubic metres of flow per hour to be displayed and logged. 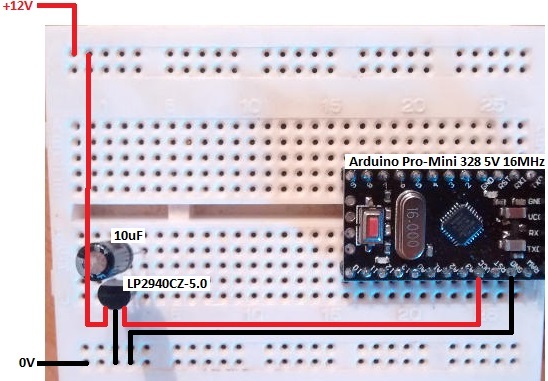 As we did not have access to this flow rate sensor, we had to use a second Arduino to simulate the square wave the sensor generates to fully test the device we built. 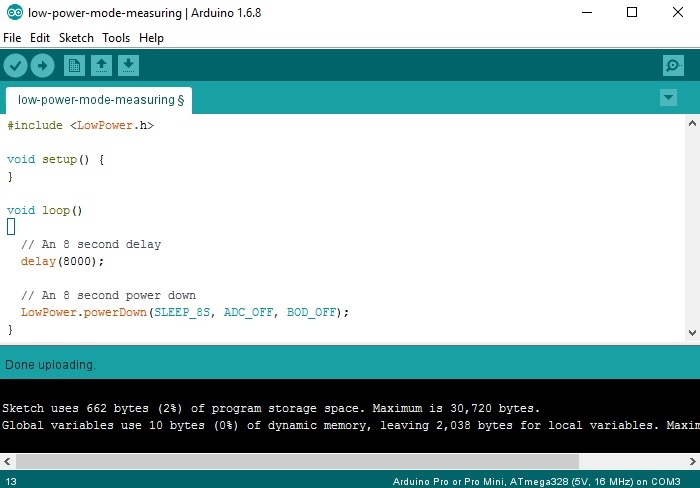 With a maximum of 1000 pulses per second to detect (for the maximum expected 12m3 per hour flow rate), the 16MHz clock of the Arduino Pro Mini was more than up to the job of simulating the sensor. If you need any kind of timer or multi-channel datalogger, please email neil@reuk.co.uk with details of your requirements. Our 2016 Solar Water Heating Pump Controller is one of our most popular products. Pictured below is a derivative recently requested by one of our clients. This controller will be used to control the operation of a pump circulating water through a solar thermal panel. 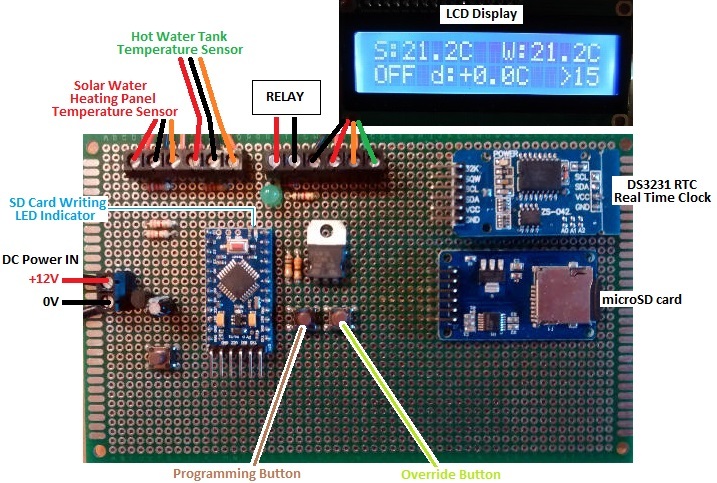 Our standard controllers have at least two sensors – one for the pool/tank and one for the solar panel – but for this particular project only one sensor could be used: at the solar panel. 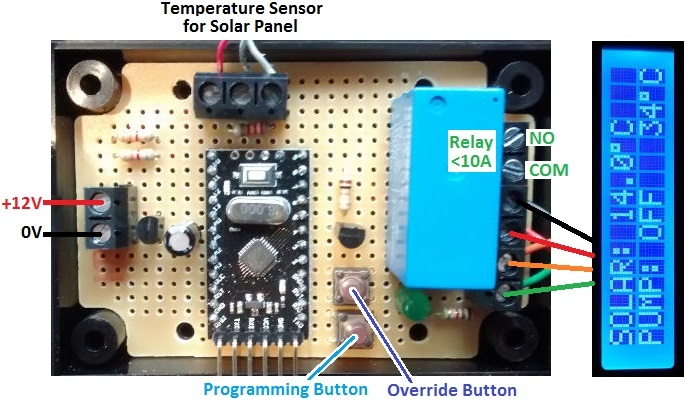 Therefore, instead of using the temperature differential between the solar panel and the pool to decide when the pump should be turned on or off, the user sets a high temperature threshold above which the pump will turn on, and a low temperature threshold below which it will subsequently turn off. Sensible starter values would be 70 degrees C at the panel to turn on the pump, and around below 35-40 degrees at the panel to turn off the pump. With experimentation and analysis (this device has a built in datalogger) it will be possible to refine these thresholds to maximise efficiency. The pump should not be turning on and off too frequently and running for very short times, but the panel should also not be left at very high temperatures for a long time or it will radiate heat away before it can be transferred to the water. If this device was to be used in a small pool or hot tub, and if the arriving hot water from the panel is pumped straight in without pre-mixing, a lower pump turn on temperature would be essential so that no-one gets burned on the incoming hot water. If you need any kind of pump controller, email neil@reuk.co.uk with details of your specific requirements.